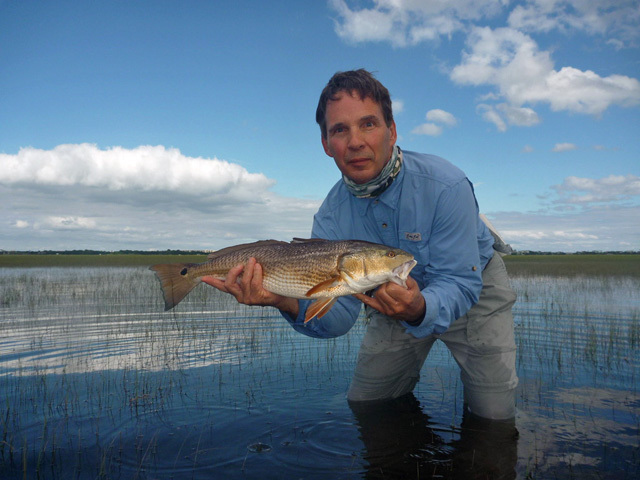 Flats fishing often requires going in very shallow water, where motors are no longer effective, since their propellers draft too much. 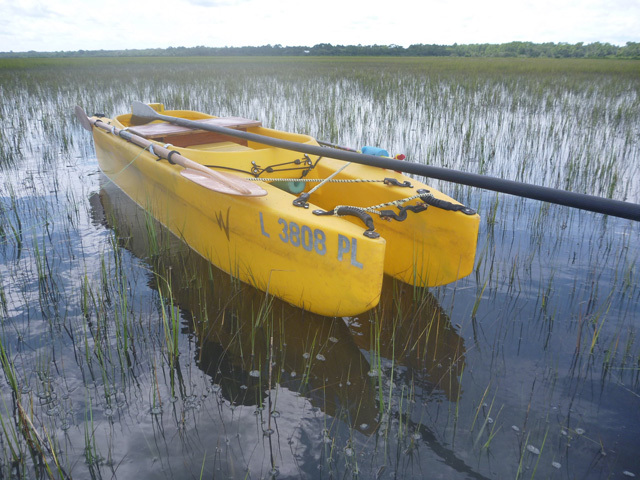 Flats boats, namely skiffs and micro skiffs, can be propelled manually with a poling pole. 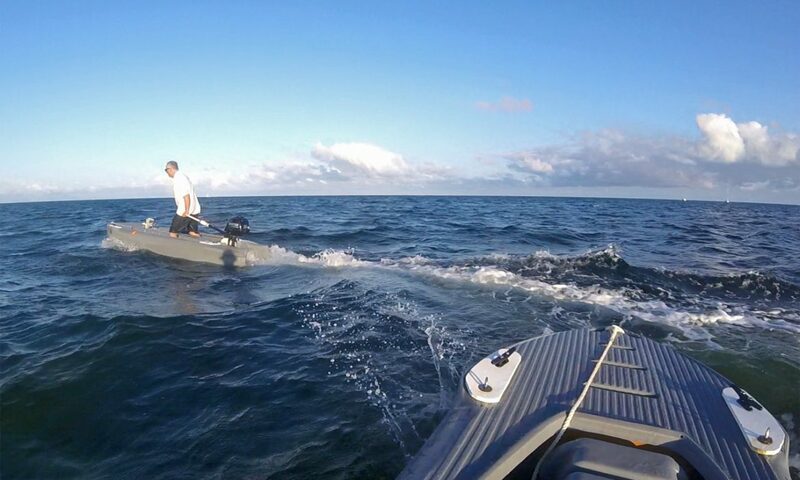 However, poling is hard, and not as effective as paddling, which is why a micro skiff such as the Wavewalk S4 offers an advantage to skinny water anglers, since it works perfectly in a paddling mode, as a kayak and a canoe. 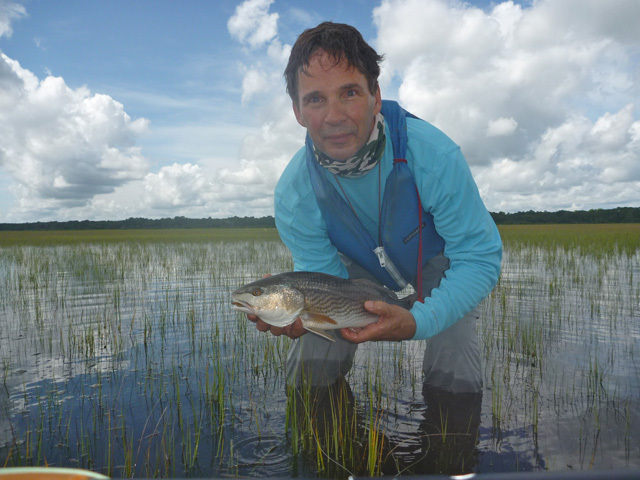 I thought I’d send you another report from sunny Florida as the sun is setting for the Northern kayak fishing season. Our inshore waters remain high with continued unpredicted floods at high tide so I took advantage of one this morning before work. Again, this fish took some work to find, though the catching was easy. I poled to a couple of my not so secret secret spots only to find not enough water and no fish. I decided to leave since it didn’t look like the water was coming up and I hadn’t seen any fish on my way in. I figured that would be the end of it for the day since the tide was receding. There is little bait left in the grass after two weeks of twice daily flooding there are very few fish foraging now. 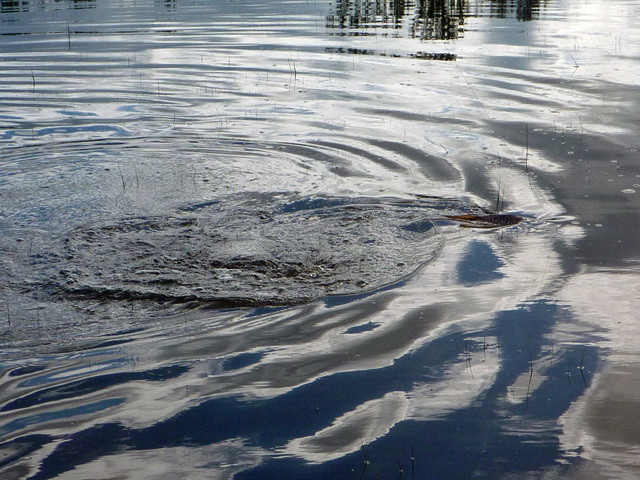 I checked out one more small flat near the launch on the way back and did find one lonely fish to stalk. I was fortunate to get a couple of good casts and he was interested in my offering (spoon fly). It was a nice long fight thanks to the cooler waters as fall creeps in. So, not big numbers but at least there was no skunk today. It’s been fun this year learning to use the fishing belt I made that holds my fly rod and push pole so I can cast from the poling platform an not have to put everything down, then wade after the fish. I think I’ve managed to get casts at fish that I would normally not have. An added bonus is staying dry for the whole trip. 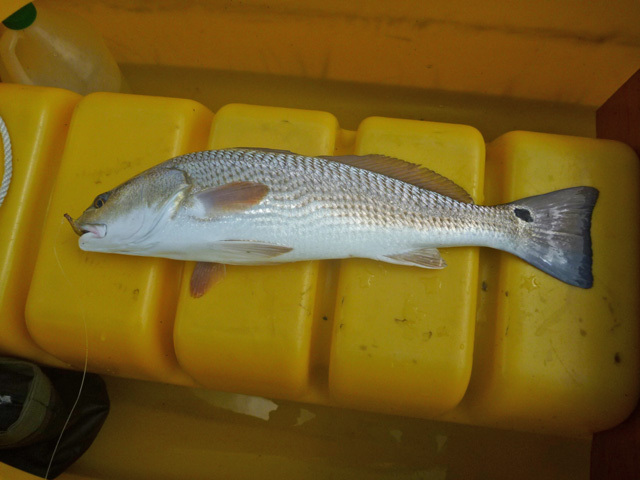 Well, I managed to squeak out a single fish again on my last trip of three for October’s flood tide period. We actually had too much of a good thing. The floods were predicted higher and longer than normal and we had the addition of storms off shore that were keeping the water in the inlets for this period. That made for some difficult fishing. Water levels were about two feet above normal flood and flooding was occurring hours before predicted. Winds also made it difficult to pole the kayak. I had two unsuccessful trips earlier in the week and only saw a couple of fish that I couldn’t get set up to cast to. I had decided not to go out again because of the conditions but Sunday was sunny and the winds had subsided. At the last minute I decided to give it a go and packed the truck for a quick trip. I arrived a bit late but fortunately the tides were still fishable. I poled quite a distance and eventually found a lone fish that I could get a few casts too. Luck was with me and it was finally teased into going for my spoon fly. Now another month of waiting for what will likely be the last decent flood to fish for the year. We usually have one in December too but the temps have dropped enough by then that there is little bait in the grass so the fish don’t feed heavily. 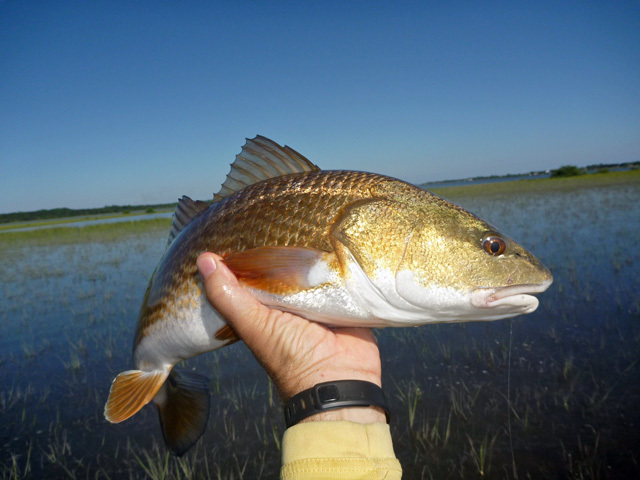 Flood tide fishing, three days, nine hours, one fish! Not real impressive but I did end up with one to take a picture of. 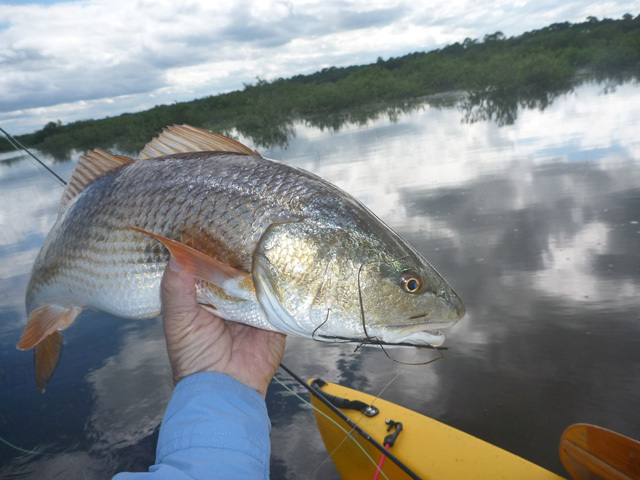 I was able to get out three days last week for my favorite flood tide fishing. I wasn’t as successful as I’d hoped for but in the end I was able to at least get you one picture of my prey. The first day I had a nice hook up on a fish and a short fight, only to have my leader break and see the fish go swimming off with my fly in his mouth. Briefly exciting but not real rewarding. That was my only hook up for the day. I got out the second day and wasn’t having a lot of luck finding fish that were interested in my offerings. Finally I found one that decided my spoon fly looked tasty. Again, I got a nice hook up and brief fight, only to have the hook pull loose and come flying back at me. Apparently I didn’t set the hook well enough. Once again that was my only hook up for the day. The third day I was tired and decided I wasn’t going to get up early. I couldn’t really sleep so I got out of bed and decided I may as well give it one more go than lay in bed awake. That was a good decision since the third time was a charm and I was able to hook a nice fish and actually land it. Now I have to wait a few more weeks for another flood, hopefully with some better luck.